A World with No Meetings?! If you had to identify, in one word, the reason why the human race has not achieved, and never will achieve, its full potential, that word would be: meetings. As funny as I think Dave Barry can be, and in spite of the fact that he is correct to imply that meetings are often not the most efficient way to get things done, I am one of those weird people that actually enjoys meetings. Not ALL meetings, obviously, but more than half of them. And even during un-enjoyable (i.e. unproductive) meetings I try to walk out with something that I can take with me and make useful…and I usually can (even if occasionally what I walk away with is a firm resolution to never impose a similar meeting on anyone). Clearly, some meetings are more valuable than others but why? Reflecting on my current position in academia I feel that within the division of the library in which I work a pretty high percentage of our meetings are useful. Often they are a time to collaborate. The best meetings are those in which we get together with the intention of making decisions collectively and leave the meeting having done so…or in which the goal of the meeting is to learn something specific. The worst meetings, on the other hand, are those without a clear goal and, my personal pet peeve, those focused on brainstorming. As an example of a “good” meeting: twice a month I go to a meeting with the other members of the “Acquisitions Team” which consists of three collection development librarians (I am one of them), the Media Librarian and our Collection Assessment Librarian. We discuss areas of the collections that are important or need resources (based on data collected by our assessment librarian) and make decisions about how to curate our collection. And that is key: our goal is to make decisions; we do not just talk about ideas. There is a clear agenda for each meeting and a dedicated online space for our group to collaborate and communicate between meetings so that we are all up-to-date. These are useful meetings. Quite a few of the meetings I attend are with vendors. As the Electronic Resources Librarian vendor communication is a huge (HUGE) part of my job. Some of these meetings are in-person while others are webinars, usually demos of products we own but occasionally demos of products we are evaluating or trialing. Sometimes these meeting are just myself and a vendor rep, other times these meetings involve more people – often subject librarians and even faculty. These meetings are almost always useful because they are an opportunity to learn about resources that support our users. Sure, you can read about vendors and resources online or watch tutorials but the chance to ask questions and see a demonstration of the value of a particular resource to our specific users is invaluable. And then, of course, there are committee meetings. Whether you are a member of the teaching faculty or a faculty(-equivalent) librarian you attend committee meetings! Honestly, some of these are pointless in the sense that we could get done what we get done without meeting and in probably a lot less time. I think the reason these are “necessary” is often because the tendency of many people is to not participate if they don’t have to show up somewhere and I don’t know if that will ever change. Whether the main focus of your job is teaching, working in administration, or running the library, it is really easy to put committee work on the back burner. I have to schedule time on my calendar to prepare for meetings or else I will get busy and forget because my day-to-day responsibilities are more obvious. If I don’t respond to an email about an ebook issue or complete an order form, etc the library (or at least my little part of the library) will not be functioning smoothly. If I don’t prepare for a meeting of the Undergraduate Curriculum Committee there is not an immediate problem although in the long term if committees aren’t doing the planning the university will stop functioning smoothly…therefore meetings wherein we vote on new courses are useful. One or more concrete decisions being made or measurable outcome accomplished. An agenda in place and followed. I have certainly attended meetings that were not useful. My personal frustration is highest with “brainstorming meetings”. These are usually somebody fleshing out an idea while everyone else contributes minimally or not at all. The person doing the brainstorming is almost always the person who called the meeting. If you want to do collaborative brainstorming make sure you include 1, 2, and 3 from above. Have an agenda, be sure you have an objective outcome to attain and be sure that the project or program you want to brainstorm about will benefit from information that every single invitee provides. This post has been a round-a-bout way of getting to my point: meetings can be useful but there are limits to that and requirements for any meeting that must be met in order to achieve usefulness. 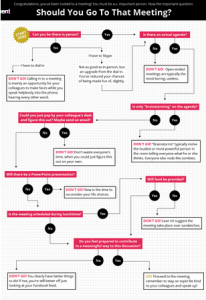 I absolutely love this flowchart from the Huffington Post. It doesn’t perfectly match my own opinion or what I perceive to be the needs of my department but I would like to rework it to do so. If I get that done, I will come back and update this post but I haven’t had time to get to it yet – to many meetings! I’m wondering what works for meetings at other academic libraries. What makes your meetings useful? Are they ever useful? Would you be happy in a world with NO meetings? I wouldn’t but I recognize that I might be in the minority.